Noodles are a staple part of Japanese cuisine. They are often served chilled with dipping sauces, or in soups or hot dishes. Remarkably, none of the following are rice-based. Ramen are thin, wheat-based noodles made from wheat flour, salt, water, and kansui, a form of alkaline water. The dough is risen before being rolled. They were imported from China during the Meiji Period. 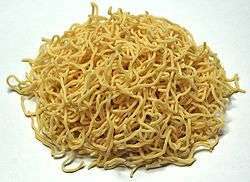 Ramen noodles have a firm texture and are usually pale yellow in color. The noodles may vary in shape, width, and length. They are served in a broth. Examples of ramen dishes are Shoyu ramen, Shio ramen, Miso ramen, Tonkotsu ramen, and Curry ramen. Shirataki are clear noodles made from konnyaku. These noodles are chewy or rubbery. Shirataki are used to add texture to dishes such as sukiyaki and oden. Soba is a noodle made from buckwheat and wheat flour. Soba noodles are available dried or fresh. They may be served with hot broth or cold with dipping sauce. Examples of soba dishes are zaru soba (chilled), kake soba, tempura soba, kitsune soba, and tororo soba. Although the popular Japanese dish Yakisoba includes "soba" in its name, the dish is made with Chinese-style noodles (chūkamen). Sōmen noodles are a very thin, white, wheat-based noodle. They are usually served chilled in the summertime with dipping sauces although they may be used in soups and other hot dishes. Sōmen noodles are very similar to hiyamugi and udon noodles, only they are thinner (about 1.3mm in width). Sōmen requires oil in its manufacture. During the summer months Japanese consume chilled sōmen to stay cool. Hiyamugi are wheat flour noodles similar to sōmen and udon noodles and somewhere in between the two in size. These noodles are often served in the same manner as sōmen and udon noodles. While they are mostly white, there are bundles mixed with noodles of pinkish or brown hues. Udon are the thickest of the noodles served in Japanese Cuisine. 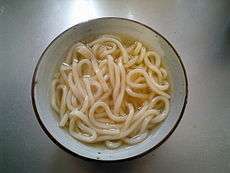 Udon are white, wheat-based noodles, that are 4-6mm in width. These noodles are served chilled with a dipping sauce in the summer months, or in hot dishes and soups when the temperature is cooler. Udon dishes include kitsune udon, Nabeyaki udon, curry udon, and yaki udon. However, sara udon is made using a different kind of noodle which is crispy. Harusame are glass noodles made from potato starch. Tokoroten are jelly-like slices of Agar with a rectangular cross-section.